For the past 30 years, my actual paid job (as opposed to my blogging hobby) has been Managing Editor of the Journal of Economic Perspectives. The journal is published by the American Economic Association, which back in 2011 decided--much to my delight--that the journal would be freely available on-line, from the current issue back to the first issue in 1987. 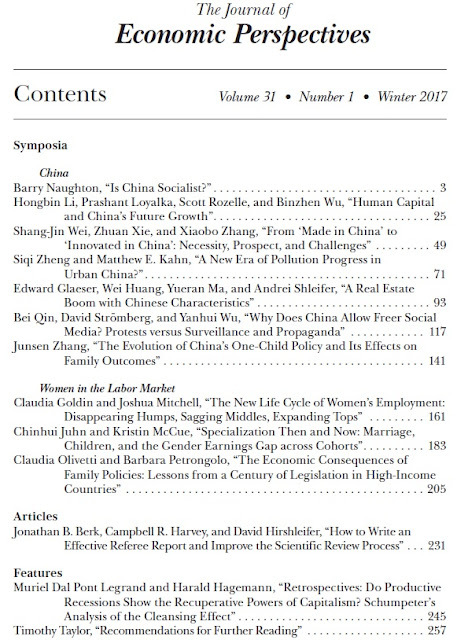 Here, I'll start with Table of Contents for the just-released Winter 2017 issue. Below that are abstracts and direct links for all of the papers. I will almost certainly blog about some of the individual papers in the next week or two, as well. It has been 40 years since Deng Xiaoping broke dramatically with Maoist ideology and the Maoist variant of socialism. Since then, China has been transformed. Forty years ago, in 1978, China was unquestionably a socialist economy of the familiar and well-studied "command economy" variant, even though it was more decentralized and more loosely planned than its Soviet progenitor. Twenty years ago--that is, by the late 1990s--China had completely discarded this type of socialism and was moving decisively to a market economy. China today is quite different both from the command economy of 40 years ago, and from the "Wild West Capitalism" of 20 years ago. Throughout these enormous changes, China has always officially claimed to be socialist. Does the "socialist" label make sense when applied to China today? In this paper, we consider the sources and prospects for economic growth in China with a focus on human capital. First, we provide an overview of the role that labor has played in China's economic success. We then describe China's hukou policy, which divides China's labor force into two distinct segments, one composed of rural workers and the other of urban workers. For the rural labor force, we focus on the challenges of raising human capital by both increasing basic educational attainment rates as well as the quality of education. For the urban labor force, we focus on the issues of further expanding enrollment in college education as well as improving the quality of college education. We use a regression model to show the typical relationship between human capital and output in economies around the world and demonstrate how that relationship has evolved since 1980. We show that China has made substantial strides both in the education level of its population and in the way that education is being rewarded in its labor markets. However, as we look ahead, our results imply that China may find it impossible to maintain what appears to be its desired growth rate of 7 percent in the next 20 years; a growth rate of 3 percent over the next two decades seems more plausible. Finally, we present policy recommendations, which are rooted in the belief that China continues to have substantial room to improve the human capital of its labor force. After more than three decades of high growth based on its low-wage advantage and relatively favorable demographics--in combination with market-oriented reforms and openness to the world economy--China is at a crossroads with a much higher wage and a shrinking workforce. Future growth will depend, by necessity, more on the generation of increased productivity, and domestic innovation will play an important part in this. In this paper, we assess the likelihood that China can make the necessary transition. Using data on expenditure on research and development, and patent applications, receipts, and citations, we show that the Chinese economy has become increasingly innovative. We will argue that rising wages and expanding markets are among the important drivers of China's growth in innovation. On the other hand, we find evidence of resource misallocation in the innovation area: while state-owned firms receive more subsidies, private firms exhibit more innovation results. Innovation can presumably progress even faster if resource misallocation can be tackled. Over the last 30 years, China's economy has boomed. This trend has lifted hundreds of millions of Chinese out of poverty but it has also sharply increased local, regional, and global pollution levels. We look at the rise in air pollution over recent decades, and the perhaps surprising finding that in many of China's urban areas, levels of particulates (of less than 10 microns) have been decreasing during the last 10 to 15 years. We then turn to the costs and tradeoffs of air pollution, including costs to human health, reductions in worker productivity, and how people are seeking to reduce their exposure to pollution as shown by compensating differentials in real estate prices and purchases of masks and air filters. We discuss how rising incomes tend to raise the demand for environmental amenities and thus increase political pressure for environmental protection, and then we turn to the policy tools that China has used to reduce pollution. We conclude by arguing that as China's government is preparing for an additional 300 million people to move to urban areas over the next 30 years, it will have a number of opportunities for China to reduce pollution through a shift from manufacturing to services, along with various steps to improve energy efficiency and resource conservation. Overall, it seems that China is on track to improve its environmental performance in the years ahead. Chinese housing prices rose by over 10 percent per year in real terms between 2003 and 2014 and are now between two and ten times higher than the construction cost of apartments. At the same time, Chinese developers built 100 billion square feet of residential real estate. This boom has been accompanied by a large increase in the number of vacant homes, held by both developers and households. This boom may turn out to be a housing bubble followed by a crash, yet that future is far from certain. The demand for real estate in China is so strong that current prices might be sustainable, especially given the sparse alternative investments for Chinese households, so long as the level of new supply is radically curtailed. Whether that happens depends on the policies of the Chinese government, which must weigh the benefits of price stability against the costs of restricting urban growth. In 1979, China introduced its unprecedented one-child policy, under which households exceeding the birth quota were penalized. However, estimating the effect of this policy on family outcomes turns out to be complicated. China had already enacted an aggressive family planning policy in the early 1970s, and its fertility rates had already dropped sharply before the enactment of the one-child policy. The one-child policy was also enacted at almost the same time as China's market-oriented economic reforms, which triggered several decades of rapid growth, which would also tend to reduce fertility rates. During the same period, a number of other developing countries in East Asia and around the world have also experienced sharp declines in fertility. Overall, finding defensible ways to identify the effect of China's one-child policy on family outcomes is a tremendous challenge. I expound the main empirical approaches to the identification of the effects of the one-child policy, with an emphasis on their underlying assumptions and limitations. I then turn to empirical results in the literature. I discuss the evidence concerning the effects of the one-child policy on fertility and how it might affect human capital investment in children. Finally I offer some new exploratory and preliminary estimates of the effects of the one-child policy on divorce, labor supply, and rural-to-urban migration. A new life cycle of women's employment emerged with cohorts born in the 1950s. For prior cohorts, life-cycle employment had a hump shape; it increased from the twenties to the forties, hit a peak, and then declined starting in the fifties. The new life cycle of employment is initially high and flat, there is a dip in the middle, and a phasing out that is more prolonged than for previous cohorts. The hump is gone, the middle is a bit sagging, and the top has greatly expanded. We explore the increase in cumulative work experience for women from the 1930s to the 1970s birth cohorts using data from the Survey of Income and Program Participation and the Health and Retirement Study. We investigate the changing labor force impact of a birth event across cohorts and by education, and also the impact of taking leave or quitting. We find greatly increased labor force experience across cohorts, far less time out after a birth, and greater labor force recovery for those who take paid or unpaid leave. Increased employment of women in their older ages is related to more continuous work experience across the life cycle. In this paper, we examine the evolution of the gender gap associated with marriage and parental status, comparing cohorts born between 1936 and 1985. The model of household specialization and division of labor introduced by Becker posits that when forming households, couples will exploit the gains from trade by having one spouse specialize in market work while the other specializes in household work. Given the historical advantage of men in the labor market, the model predicts specialization by gender and therefore an earnings advantage for married men and an earnings disadvantage for married women. Is this model of specialization useful for understanding the evolution of the gender gap across generations of women? And what about children? Academic papers have shown that wages of mothers are significantly lower than those of non-mothers with similar human capital characteristics. We do not attempt to build a structural model here, but rather document how changing associations between marriage and earnings, and between children and earnings, have contributed to the gender gap in an "accounting" sense. By the early 21st century, most high-income countries have put into effect a host of generous and virtually gender-neutral parental leave policies and family benefits, with the multiple goals of gender equity, higher fertility, and child development. What have been the effects? Proponents typically emphasize the contribution of family policies to the goals of gender equity and child development, enabling women to combine careers and motherhood, and altering social norms regarding gender roles. Opponents often warn that family policies may become a long-term hindrance to women's careers because of the loss of work experience and the higher costs to employers that hire women of childbearing age. We draw lessons from existing work and our own analysis on the effects of parental leave and other interventions aimed at aiding families. We present country- and micro-level evidence on the effects of family policy on gender outcomes, focusing on female employment, gender gaps in earnings, and fertility. Most estimates range from negligible to a small positive impact. But the verdict is far more positive for the beneficial impact of spending on early education and childcare. The review process for academic journals in economics has grown vastly more extensive over time. Journals demand more revisions, and papers have become bloated with numerous robustness checks and extensions. Even if the extra resulting revisions do on average lead to improved papers--a claim that is debatable--the cost is enormous. We argue that much of the time involved in these revisions is a waste of research effort. Another cause for concern is the level of disagreement amongst referees, a pattern that suggests a high level of arbitrariness in the review process. To identify and highlight what is going right and what is going wrong in the reviewing process, we wrote to a sample of former editors of the American Economic Review, the Journal of Political Economy, the Quarterly Journal of Economics, Econometrica, the Review of Economic Studies, and the Journal of Financial Economics, and asked them for their thoughts about what might improve the process. We found a rough consensus that referees for top journals in economics tend to make similar, correctable mistakes. The italicized quotations throughout this paper are drawn from our correspondence with these editors and our own experience. Their insights are consistent with our own experiences as editors at the Journal of Finance and the Review of Financial Studies. Our objective is to highlight these mistakes and provide a roadmap for how to avoid them. chumpeter has often been interpreted as a "liquidationist," someone who is convinced that economic crises are necessary and unavoidable, and thus that government nonintervention is a sound policy in such crises. The first two sections of this paper discuss Schumpeter's views in greater detail and suggest that categorizing him as a "liquidationist" is an oversimplification and as an unrepentant "noninterventionist" is incorrect. Although Schumpeter was certainly not a strong supporter of public interventions, he did see a role for public expenditure programs in particular circumstances. During periods of recession, Schumpeter believed firmly in what he described as the "recuperative powers of capitalism." However, when a depression becomes "pathological," there could be a role for government to intervene. In order to understand the overall picture of Schumpeter's message, we will first try to explain Schumpeter's analysis of recessions, depressions, and the other stages of business cycles. We will also discuss how Schumpeter perceived the recuperative powers of capitalism, a core concept in Schumpeter's analysis that allows him to distinguish between physiological and pathological recessions. 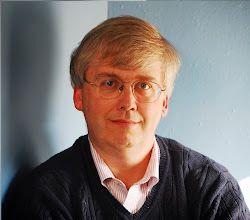 In the 1990s, an active line of research examined the possibility that recessions may have a productive character along with their more obvious negative outcomes, because recessions in some way might hasten the process of reallocating economic recourses from slower-growth to faster-growth sectors. Such models were sometimes referred to as "neo-Schumpeterian," but given our analysis of Schumpeter's work, we will question whether this label is appropriate.